Many of us who has experience of deploying application back-end in Google Cloud Platform, are familiar with these screens. During deployment with Eclipse, if there is any network issue, the deployment never got completed. Now in this moment, there are 2 way you can get rid of it. One is forcefully stop/cancel the deployment. And the other one is by closing eclipse. After this, if you try to deploy the same application, it throws one of the above error. Sometimes if more than one developer try to deploy the same application at the same time, the issue may arise. 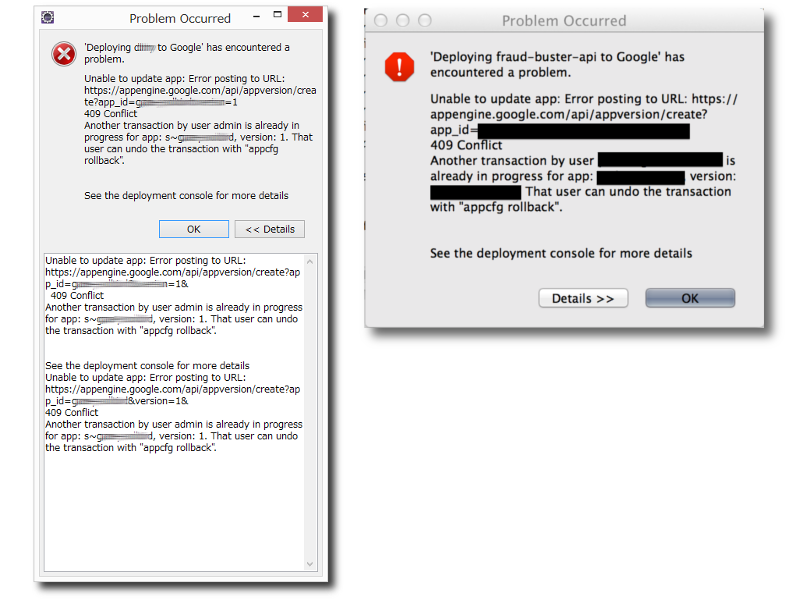 The Google Cloud SDK generates an error dialog saying- “…user can undo the transaction with ‘appcfg rollback‘”. It’s a tool for deploying application manually in Google Cloud. The tool is included with the original App Engine SDK. As per the instructions provided by Google- https://cloud.google.com/appengine/docs/standard/java/tools/uploadinganapp, to deploy your app to App Engine, you run Maven (recommended) or the appcfg command from within the root directory of your application. appcfg.sh should ideally be run using Java 7 (also known as 1.7). This command is used for a variety of application management tasks including deploying your app and updating datastore indexes. The appcfg tool is included with the App Engine SDK, which you can download and install at App Engine Java SDK. <app-dir> must be the directory that contains your WAR file. rollback: Rollback an in-progress update. 1. Open the .bashrc file from your ‘home’ directory. We are using ‘Gedit’ instead of command line editor. 2. Add The line at the end of the file and updates PATH for the Google Cloud SDK. 3. Also add this line to enables bash completion for gcloud. 4. Now save the .bashrc file. You can restart your system, if require. 5. Go to your App Engine SDK’s bin folder. 6. Make appcfg.sh and run_java.sh executable. 7. Now run the below command. Look at the last parameter after rollback. It is the directory path of your application’s ‘war’ folder. After this a browser window with Google consent screen will appear and it’ll ask for your Google account credentials. Once you provide them and validate, BINGO! The rollback will start.